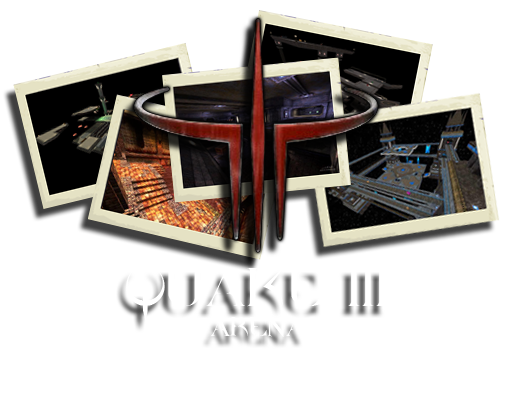 The Quake 3 Arena heXum collection is a group of 5 maps that I made primarily for LAN play with my buddies. I would try out any gimmick I could think of that felt clever or changed the way you'd play a regular deathmatch. These experiments yielded varying levels of success. This pack is called the "heXum collection", since that was my online handle when I released them on LvL and other sites. Kothill - My first Q3 level. It's safe to say that I was experimenting, and learning a lot, with this map. Q3Arenaz - From the review on Lvl: "Arenaz is an odd duck to be sure. It consists of four separate areas all interconnected with a central spawn point (for humans, bots spawn anywhere). Each area has a specific theme to it: Rocket - a small room with an outer ring chamber, red fog and red walls. Rail - Pyramix structure with a central MH pickoff bounce pad. Very vertical. Shotgun - Tight twisty dark hallways. Grenade Launcher - Small bright chamber with little room to hide." The Flooded Base - This is probably my best example of good lighting and atmosphere in Q3. Overall the map plays well with 4 to 8 players, and there are a handful of secrets to be found. I believe this was the last level I made for Quake 3. The Tower Battleground - Another gameplay experiment, this time with low gravity and teleports. The map was mostly praised over its architectural design and texture use. The towers were a study in gothic architecture. The gameplay is really only suggested with a group of people, rather than bots, since they tend not to use the bounce pads to get around. Oingo Boingo - Another space map. This level was based around some concepts from my favorite Quake 3 map, DM17. A reviewer called it "a level for professionals", since bots are particularly lethal due to the open nature of the map. The name is terrible. This collection is available as a pack here: Download "heXum collection"
Each map can also be downloaded individually from my author page on Lvl.